This was the toughest ford to date. 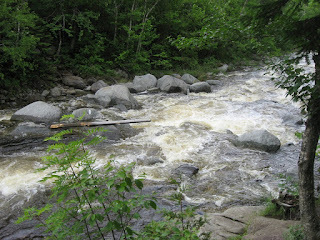 While in the trail town Stratton, Maine, we heard that the river was quite high and many people decided to "yellow blaze" - skip that section. In my mind and for my trip that would mean a non-completion of an AT Thru-Hike. The official regulations allow detours only for safety reasons. A northbound hiker had come through the day before and said that he "rock-hopped" the crossing and the water only came up to his ankles. Since he was the only first-hand report, I decided to make the crossing. Reports indicated that the first part of the crossing was on rocks leading to a boulder center stream. From there a bridge went across the rest of the way. While on trail, met Tenacious Turtle and Lacota coming the other way. They said "you made the right decision, the water is one foot below the bridge". Good news. On reaching the Carrabassett however, the water had risen again and now the last 30% of the "bridge" (a single plank of wood) had water rushing over it. Climbed out to the large boulder in the center of the river. The plank bridge had a hole in the end with a heavy metal cable looped through it and the boulder. Started across, but it seemed a bit shaky. Assuming the other end also had a cable holding it in place, reached down to adjust the plank. To my great surprise, the other end whipped off the rock and out of my hands. Since the board and cable were upstream from me on the boulder, it almost swept me off the rock! Pulled in the board and tried to find a way to reset the bridge. Impossible. Decided to ford and found a spot just downstream. Started across. Water up to my waist but as my body blocked the fast moving water, it soon came much higher. My hiking poles were firmly planted. My feet were firmly on the floor of the stream. The water pushed up to my chest. I was quickly pulled off my feet and DUNKED, face down with pack on, in a torrential flowing stream! Dove for the far side. Got past the fastest moving part. Scrambled to my feet, now with water weight in pack and clothes. Tiring. Got to the far side with only a small rock bruise on one leg. The sun came out for about 45 minutes, and I dried out and warmed up. Fortunately clothes and sleeping bag were dry. It was a cold night that night and a warm sleeping bag was essential. Fortunately that night (as most) there were other hikers in the Lean-To (shelter) so help was available if needed. The other fords in Maine were far easier by comparison. Absolutely wild time. You are damn lucky. I can say with experience that you won't have any of the fording challenges once you in the Mid/South part of the trail; you will only have to worry about bears.